Hello all! I want to introduce you to Tricia, who is a pastor’s wife in Kansas. She and her husband have been in full-time ministry for only 15 months. Tricia’s new ministry in Kansas has changed her outlook on hospitality and that is why I wanted to share her testimony and hospitality tips with you. Hospitality according to the Webster’s Dictionary, is “the generous and friendly treatment of visitors and guests.” According to the Apostle Paul, we, as saints, should be “given to hospitality” (Rom 12:13). In our busy and hectic lives, have we forgotten the Lord’s command to love and serve one another? I have to be honest, I did not learn hospitality from my mother. Don’t get me wrong, my mother loved to cook and bake. She was generous with her creativity and loved to coordinate parties and get-togethers. But stop by my house unannounced, and my mother would refuse to open the door. Have you been there? The house in chaos, the kids having toys all over the living room, unfolded laundry on the couch, dishes undone, and there is no way you are opening that door to anyone!? I actually learned the true meaning of hospitality from my father. Growing up in El Paso, Texas, we lived about 10 miles from the Mexican border. Back then, the border was very “liquid.” People passed back and forth fairly easily, so very often, we would find people passing through our neighborhood on foot looking for work. And very often, I would find people sitting in our front yard under the shade of our mulberry tree. My father served them sandwiches and talked to them in broken Spanish. Most had walked all day, having crossed the Rio Grande early in the morning, with no food. Watching my Dad, I asked him why he would feed them, and he replied, “I have to give them bread to give them THE Bread,” speaking of the Spanish gospel tracts in his pocket. Yes, we are to show hospitality to ALL. Not just fellow saints, but to sinners, to show them the love of Christ. Isn’t that what Christ did when he fed the 5,000? Granted, He was on a hillside and not in a home, but whereever you are, we are called to be hospitable to all. Don’t make hospitality hard. You don’t have to have a formal dinner party for twenty, deck your house out for the holidays so that it looks like Martha Stewart lives there, or keep your house immaculately clean all the time. Relax. Just be open and welcoming! Make an effort to show hospitality regularly. Flex those hospitality muscles! Maybe once a month, invite a family from your church over for a meal. If that is too much, make it dessert and coffee. The more you are hospitable the more you will look forward to those times of fellowship! Put your home in perspective. Are you paranoid about dust bunnies under the couch or dog hair on the carpet? Most visitors won’t even notice because they are there to connect with you, not to judge your housekeeping. If you are self-conscious, make it a habit to keep the room where visitors enter your home as neat as possible. Take ten minutes to declutter daily and it will help you feel more confident when people come by. Be aware of how your children see you deal with visitors. Do they see you warmly welcoming people into your home, or hiding out when the doorbell rings? It will affect their thoughts on loving and serving others. Extend hospitality to your church. Are you welcoming to new families and visitors? Many times, what makes your church stand out will be your show of hospitality. Do you greet people? Do you show an interest in meeting people’s needs? Pray and ask the Lord to grow you in this area. Think of examples of people you know who are examples of hospitality “masters.” How do they make you feel when in their homes? How can you do the same for others? 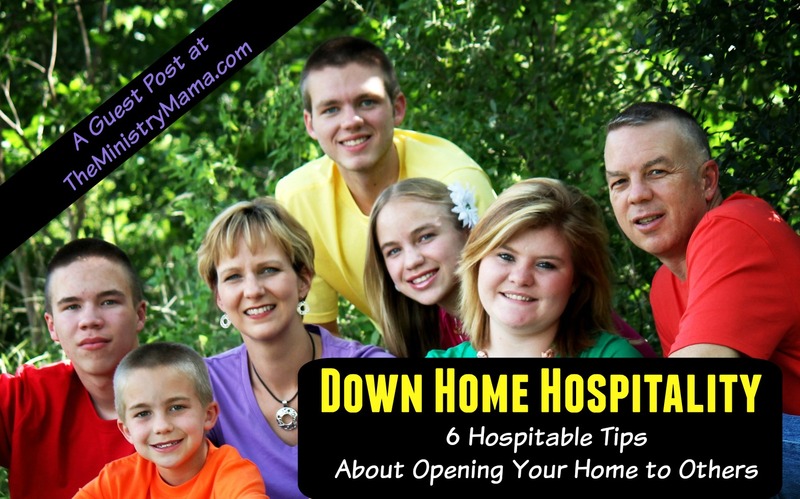 My favorite quote in Tricia’s tips is, “Flex those hospitality muscles!” If opening your home is hard for you, then start small and work up to bigger things. When you are comfortable with doing something small like actually opening the door when unannounced guests arrive, then take the next step to have people over for dessert, and then a bigger step to the next thing God prompts you to do. Certainly ask God to help you, His help is the biggest key in allowing you to be successful at having down home hospitality! Tricia and her family have been servants in their churches throughout the years by teaching Sunday School, singing in the choir, and she even taught in a Christian school. Her husband served in the Army for 20 years and she also worked at the VA. Her 5 children are ages 11-21. She is a down home kind of gal who loves gardening, tending her little flock of 20 chickens, painting, and decorating. Tricia’s favorite ministry is ladies ministry where she loves fellowshipping and spending time with her sisters in Christ.